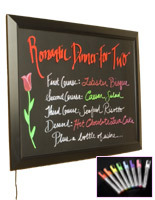 These cork boards provide an artsy and contemporary environment. 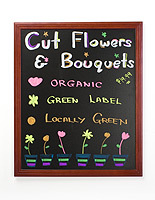 What is special about these cork boards? 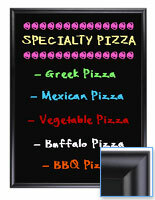 They option a backlit design that, when used with fluorescent markers, makes every message stand out from the rest. 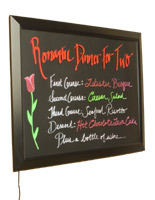 It's all about atmosphere when customers seek out your venue for a relaxed evening. 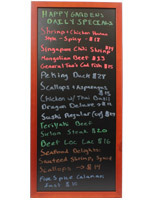 These cork boards display menu artistry in fluorescent neon colors without emitting extraneous light. 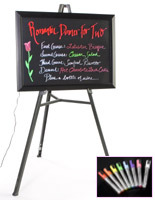 The notice boards' red, green and blue backlight places, combined with the markers' colors and line thickness, offer your artist many types of experimentation. 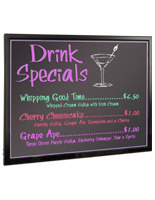 These neon signs, bulletin boards are also perfect for cinemas, pastry shops, coffee houses, restaurants and boutiques. 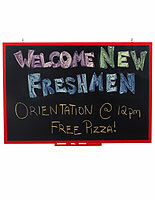 These cork boards are different from the average message sign. 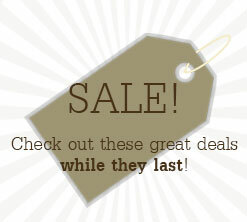 They are sure to get noticed! 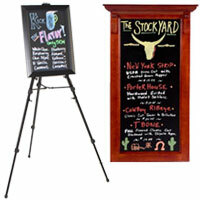 Our company offers backlit bulletin boards in wall mount or a preference of easel styles, to accommodate any space. 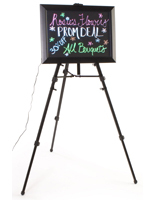 The message boards' illumination allow for a range of red, green and blue LED light effects. 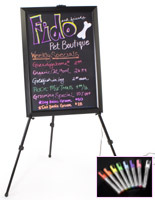 These notice boards can be used separately from the easels and markers. 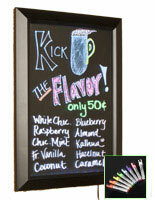 Pick from chalk pens with bullet, chisel or wide tips, from 1/8" to 5/8". 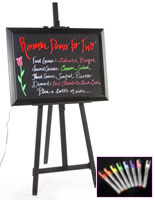 These bulletin boards are engineered for use with the markers, obtainable with chisel points for drawing thick or thin lines. 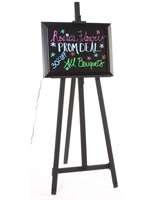 These notice boards are one of our best sellers! 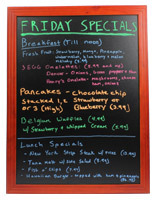 What are the benefits of these neon blackboards? 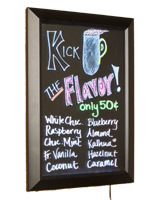 Why should I buy one of these neon blackboards? 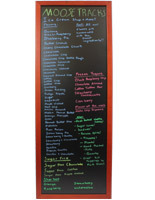 Browse for more notice boards in our huge online catalog. 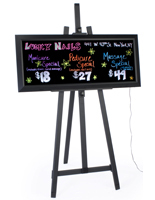 You'll easily see that CorkBoards2Go.com stocks thousands of retail, school and corporate display options, including easels, lobby signs, letter boards, wet eraser and dry eraser boards. 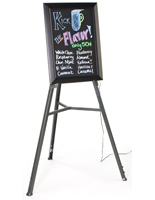 If you're looking for white boards, fabric boards, bulletin boards, notice boards, newspaper frames, message boards or brochure holders, they're here too! For answers to all your backlit notice board inquiries, chat online with one of our customer service professionals from 9 a.m. to 4:30 p.m. EST, or call them any time at 1-800-572-2194.